The edition of the Cambridge palimpsest is available online in the Cambridge Digital Library (http://cudl.lib.cam.ac.uk/collections/minganalewis). I accessed the object and its text through the simultaneous use of several kinds of digital images that I interpreted using mainly criciverbalistic/philological and kinaesthetic/palaeographical strategies. The kinaesthetic process means that I repeatedly traced and retraced the different layers of the palimpsest using tablet and pen technology : its upper-writing, the remnants of the under-writing (i.e. the sections of the under-writing ink not covered by the upper-writing ink) and a possible interpretation of the sections of the under-writing covered by the upper-writing ink. The Cambridge Digital Library displays three stages of the palimpsestic process of the Cambridge manuscript : firstly, the actual leaf as it is now, secondly, the still visible remnants of the under-writing and lastly, the hypothetical retracement of the under-writing (visible remnants and covered sections). You can watch the movements of the palimpsestic process in a very short video on YouTube (https://www.youtube.com/watch?v=M7TXGs0f9IA). The images available in the Cambridge Digital Library cannot be used as neutral and objective images. Users should consider that they are the result of my interpretation. They are my model of the original leaves before they were recycled. Moreover, they are an ekphrastic edition. The explanation of the methodology I used for the hypothetical retracement of the underwriting is available in the CUL blog, after Yasmin Faghihi’s blog post : Interpreting the Qur’ānic leaves through their digital images : a hypothetical retracement, in https://specialcollections.blog.lib.cam.ac.uk/?p=12005. Beside each hypothetical retracement (i.e. the third image available for each manuscript page of the small and large leaves), the user can visualize the manuscript edition by clicking on “view more options” and then “transcription (diplomatic)”. This option is available only for the hypothetical retracement level. I encoded my interpretation of the manuscript in order to transcribe all of the richness of the manuscript through the tools of digital philology, and I documented my interpretation of the images and their text. Thus, I produced a digital documentary edition, a born-digital edition, which tags the manuscript and its text and what I observed in them. 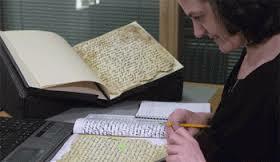 Editorial notes and tags encode the manuscript and its text in categories that build and produce a database, i.e. a searchable archive of information that the manuscript contains. Thus, I encoded the text of the Cambridge palimpsest, introducing editorial notes tagged, for example, as ‘morphology’. This means that in the online edition, a transcribed word is accompanied by a pop-up window showing the user that the word is connected – for example – with the phenomenon of the absence of cases as far as we know from early Arabic grammar. The user can read about the ‘absence of cases’, while the category ‘morphology’ is invisible to the user, but the category has been used to build a database of information, in this case from a linguistic point of view. From a traditional printed point of view, the complete description of the encoding system that I used is illustrated in my thesis and in a forthcoming article Editing and analysing the evidence of the early Qur’anic copies : Digital philology and phylogenetic networks. The complete analysis of the Cambridge palimpsest is presented in my PhD thesis and will be published in a forthcoming book, Rediscovering the Mingana Early Qur’ānic Manuscripts and Related Fragments. The digital documentary edition is – by definition – online only, and maybe in the future I will publish it in the form of a printed book. The online dimension is neither static nor linear, similar to the manuscripts with their physical layers and their diverse interpretations provided by different scholars. The documentary edition builds a database, and this archive is sharable and searchable. Hopefully, in a future larger project, the system used for encoding this manuscript will become a standard system, available online for collaborative editions and comprehension.